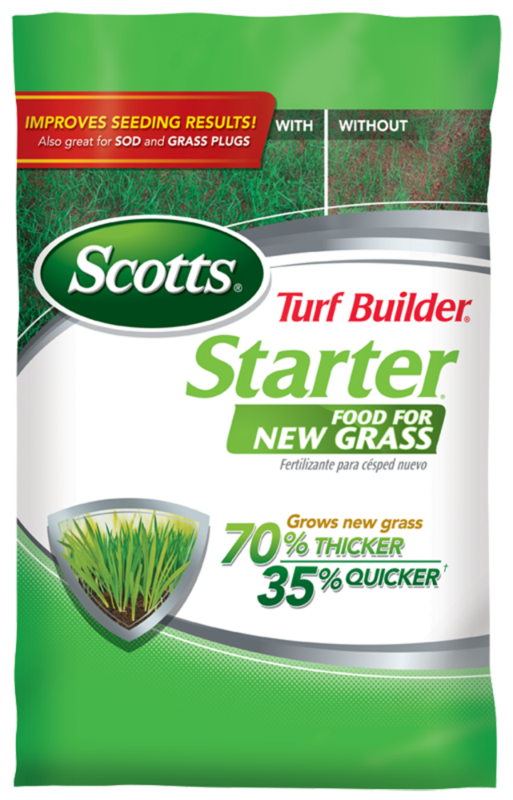 With Scotts® Turf Builder® Starter® Food for New Grass, your seedlings will benefit from a combination of nutrients that will satisfy their special needs. The Starter® Food gives new grass a quick start by promoting faster root and blade development, and the 24-25-4 fertilizer ratio providing nutrients for your developing lawn. New grass grows 70% thicker AND 35% quicker versus unfed grass, which will have you on your way to the lawn you’ve always wanted. Faster. 1,000 sq. ft., 5,000 sq. ft. and 14,000 sq. ft. Lawn products work in harmony with the environment when used correctly. Do not apply near water or storm drains or draining ditches. Do not apply if heavy rain is expected. Apply with a drop or rotary spreader. For best results, use a Scotts® spreader. Follow the color coded map to ensure your lawn receives the right amount of fertilizer. Apply as directed. CLEAN UP - To keep lawn products from reaching storm sewers, sweep or blow stray particles back onto lawn. Return unused portion of fertilizer to original container. Run any remaining product out of spreader over lawn. WATER - This product does not require watering in. However, watering is the critical step to seeding success. Keep soil consistently moist until seedlings reach 2 inches high. Do not apply near water or storm drains or draining ditches. Do not apply if heavy rain is expected. Use when planting seed, sod, sprigs or plugs. Improves seeding results! Also great for sod and grass plugs.